A magic supplement for Arcana Unearthed, but equally useful in any game. Publisher's blurb: "Magic means power in the world of the Diamond Throne. Witches, runethanes, and magisters dictate the course of history with the spells they wield. They jealously guard their secretsÃ¢? ?but this tome unveils them all for use in your campaign. 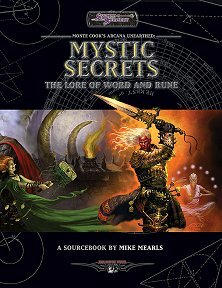 "This supplement expands the magical options available to all characters in Monte Cook's Arcana Unearthed. New spells, magic items, and methods of magic enhance any spellcaster's abilities. Ceremonies allow any character to forge mystic bonds with weapons, animal companions, and adventuring allies. New rules for runes expand their abilities while revealing the secrets behind their true nature. And mystic sites provide intriguing new vistas for magical experiments and adventure."